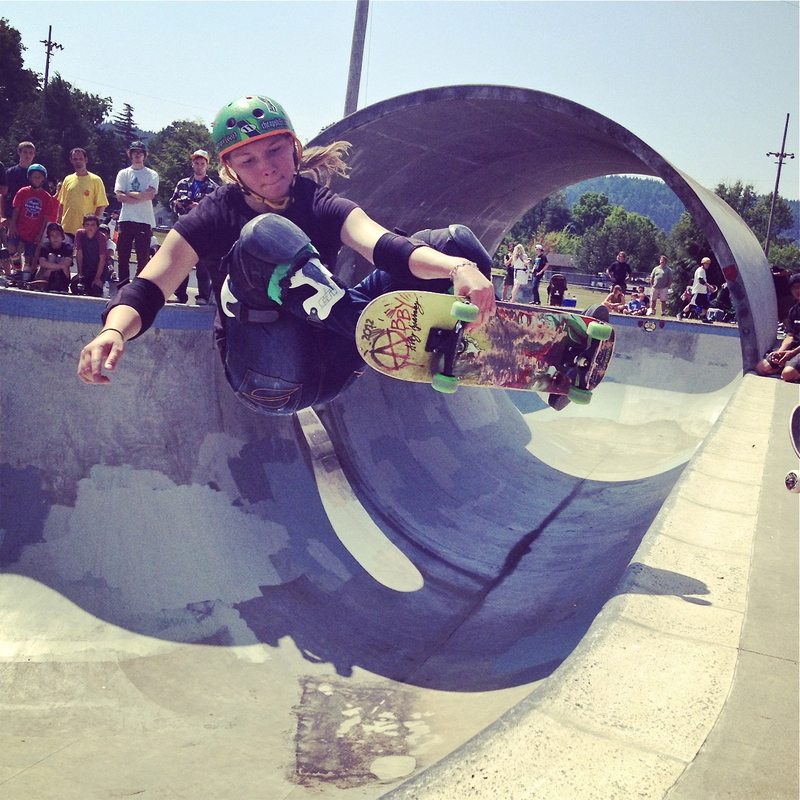 The evolution of women’s skateboarding…it is happening. And fun to watch, considering I grew up in a time and place where girls were not fostered to skate despite love at first sight. Lizzie Armanto, Justyce Tabor, Nicole Noller, Abby Zsarnay and soul shredder Colette Peterson were among the lady shreds who showed up to rule the northwest Oregon Trifecta event at Pier Park Skate Park for a mindboggling $100 top cash prize. With 3-4 foot airs out of the 11.5 foot concrete bowl, transfers over the doorway in the full pipe, switch carve lines and handplants most of the guys weren’t even attempting….only $100!? Yes. In this particular case it was mainly due to event development issues, but the stakes are rarely high for the skill and risk these ladies take. Larger purses do happen at events like the X-Games and this weeks Rocky Mountain Rampage will be offering up a $2,000 prize purse for the Women’s Bowl event (versus $4,000 for the men). Still, these are major feats we are talking about people! As any evolution story goes, the more females actually skating will naturally compute to more females ripping shred lines and pushing bags of tricks. Even though the number of ladies out there has been on the rise for the last 20 or so years and is exponentially increasing with the times, there has been a wax and wane of recognition and compensation in this realm for quite awhile, as has been seen in any initially male dominated sport. Legendary women’s skateboarding pioneer, Cara-Beth Burnside, is a testament to the gender bias at play and regardless of deep respect garnered over the years, she still contends with baffling career roadblocks. Either way, it’s really about the grind. Ladies unite. 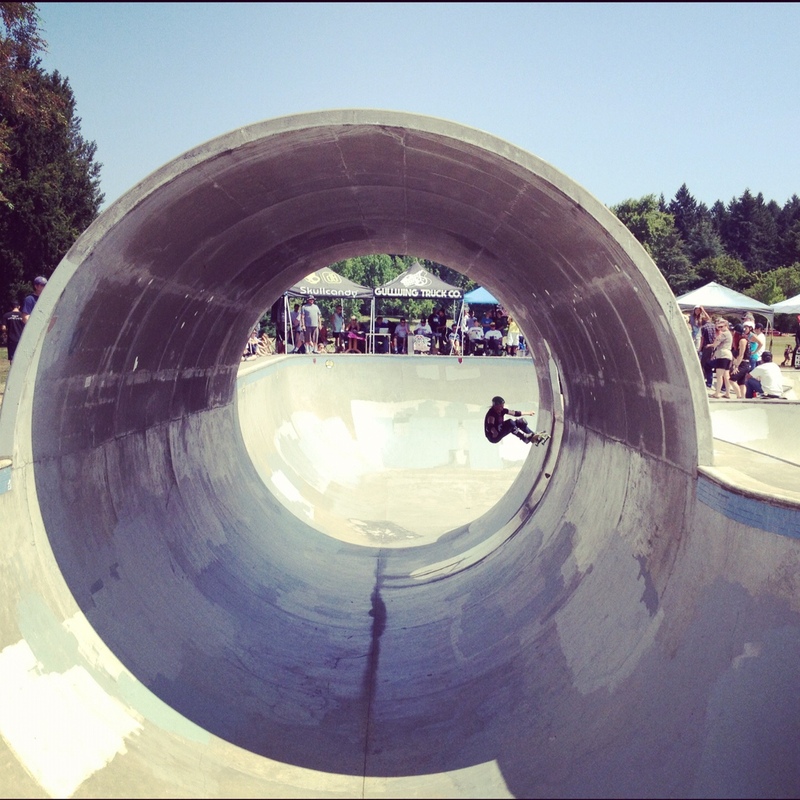 2012 marked the 10th anniversary of the Oregon Trifecta, originally founded by NW local Choppy Omega and sanctioned by the global governing organization, World Cup Skateboarding (WCS). Unfortunately, due to permit and insurance snagfu’s, the Trifecta has become a Unifecta the last few years with a one location event versus three. Nonetheless, it remains an honorable event as a stop on the WCS Bowl Series and features a ladies, am, pro and master division, in addition to strong support by Sector Nine, Skull Candy and legendary skaters. Of course the men and up & comers were fun to watch too! See all photos here.